When I woke up this past Saturday I had this urge to surprise my hubby with something new and delicious breakfast. 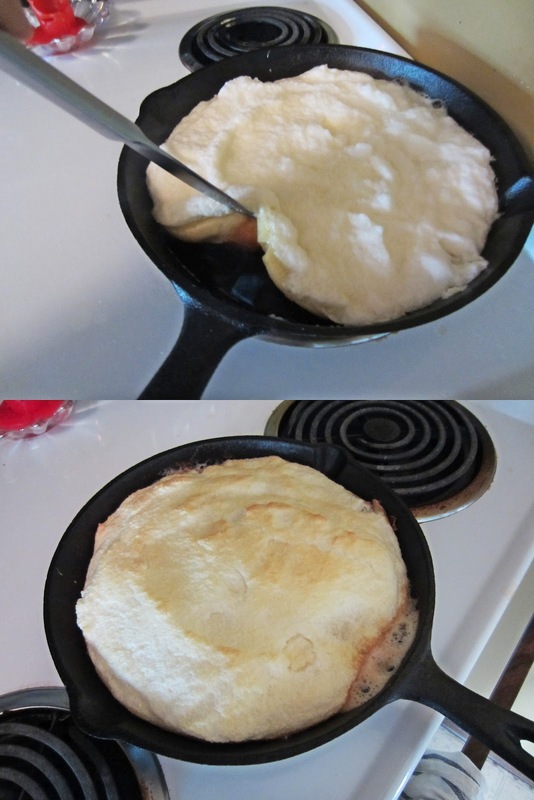 I flipped through a recipe book and landed on something I've never tried before, German Pancakes. Sounds delicious and in my head I had a vague idea of what it might look like. Since there were no pictures in the book I felt like I was sort of wining it. It called for a lot of eggs so I began mixing and whipping this creation to life. Yet something wasn't right in comparison to what I was imagining this pancake to look like. I wasn't quite sure why but this whole recipe really seemed to only consist of eggs and a few other random ingredients, no flour (so weird). But I kept to the instructions, step by step and was sure it would turn out. ...exactly what it looks like....a puffy omelet with powered icing sugar on it. It was such a terrible let down. I ended up just tossing it into the garbage minutes before he woke up and came into the kitchen. He went about making a smoothie as per usual for his breakfast and I continued on with my morning. The sad German pancake was never spoken about again. So what I had in my head for what this breakfast was suppose to look like was actually called a Dutch Baby Pancake. Sort of a close in cooking methods, but I hope the Dutch ones taste completely different. That's the saddest thing I ever heard :( Ty spent the whole morning a couple weeks ago cooking up a fabulous breakfast... and I went for a run and was starving, forced to sit on the deck. He ended up being smoked out of the kitchen and threw the whole breakfast away :( It was so sad. So I went in and made pancakes... for lunch. It was one of the sweetest things he's done for me (that day).